Wanna know why this is a messed up sketch? It's not that Jen didn't do a FABULOUS job with this Sketch For You To Try. It's not that it was a killer to work with (because it was a super fun sketch). It's not even that I spent hours trying to figure out what I was going to do with it. It's messed up, because of me...all me!! Here it is, Sunday and this was supposed to be done yesterday. I thought I was going to be superwoman and whip this card up Friday night after going to Six Flags from 10am to 10pm, missing our exit home and not getting in until 11pm. Somehow, knowing that Six Flags is a guaranteed migraine for me, I was going to stay up and create an outstanding piece of artwork late that night and if that didn't happen, I would just "hop" out of bed and do it Saturday morning and no one would even know the difference. Guess who knew the difference? MY BODY and it said I DON'T THINK YOU UNDERSTAND...I CANNOT FUNCTION TODAY!! But because I love you guys so much and it mortifies me that I didn't plan a little better, I finally got it done today. I like how it turned out, although it doesn't really have a lot of bells and whistles. 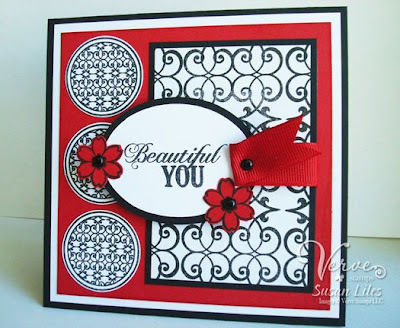 I used a few of the new sets from Verve and stuck with an easy color combo, trying to make it fit into Charmaine's Meet the Verve Diva Challenge (MTVD06), to use black and white with a pop of another color. I think I may have gone overboard with the red and made it more of a splash than a pop. Eek!! I did manage to truly mess up on the sketch as well (or maybe I just pulled a Shannan and interpreted it a little differently), and made this a square card, messed with the rectangular panel and the longish piece that should have come from the right side that I used the ribbon for. I think this sketch deserves another try sometime. I am sure you have already witnessed the beauty that all my other "I-can-do-my-sketch-on-time" friends have come up with, but in case you haven't, please check out Shannan, Amy S., Amy Rohl and Carole's creations (Carole had some timing issues as well, so please extend her a break as you did for me. Ya'll are too kind). I hope no one else unsubscribes due to our having a life and being human. I have some great things to show you next week including my Verve Project Parade! Have a fun day!! I can so understnad your felling on Six Flags..I haven't been in 8years! LOL!! You are being way too hard on yourself! It turned out gorgeous and that red is so fabulously eye catching! oh yeah! It turned out beautifully Susan! If there's one thing I've learned after 12 years of being married to a perpetually late person... things don't always have to be on time to be perfect. It REALLY is the thought that counts. :) Hope you're feeling better after your day of defying gravity. Beautiful card!! YOu are cracking me up though!! LOL!! Your card is great...love the colors!